Here we have a Black Crow sitting on top of a Street Lamp. This is the second shot from the same place i.e Albert Hall Jaipur, that I am posting here. The earlier posted shot was in the landscape format. 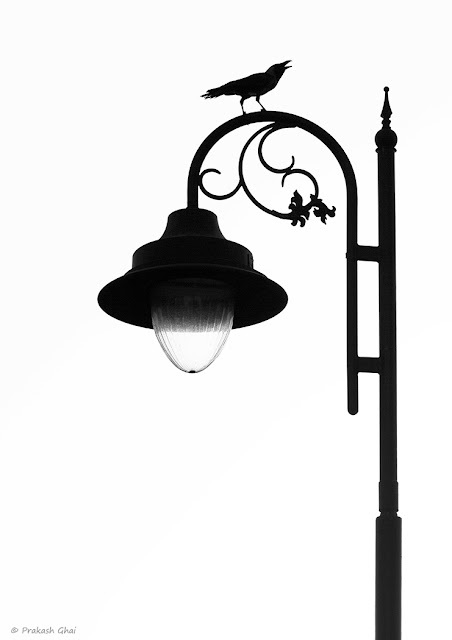 The other difference between the two Minimalist shots is that here the Bird / Black Crow is sitting on top of the Street Lamp, whereas in the other shot, the Bird is seen flying across the Street Lamp. Please Note: Both Shots Fall under the Minimalism as Less Elements Category. The Photo Settings, editing style is nearly the same, even the Exif Data is very similar. Let me know in the comments below, which one of the Two Minimalist Photographs / Shots did you find better and Why?